Satisfy Your Sweet Cravings - Roasted peanuts are gently mixed with chocolate candy pieces, dark cocoa almonds, marshmallow pieces and yogurt coated graham cracker pieces to make a mesmerizing combination of flavors that will remind you of enjoying a classic s'more by the fire. 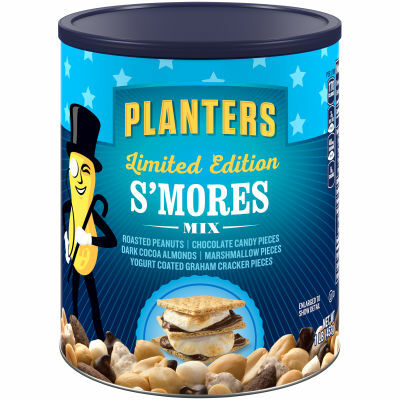 S'mores At Your Fingertips - Reach for Planters S'mores & Nut Mix when you want a gooey, chocolatey snack without the hassle of making s'mores from scratch. Available in a resealable 16 oz. can, this S'mores & Nut Mix is sure to stay fresh and please your guests time and time again. Serving size 3 Tbsp (31g).